I like to get a sense of what is going on in global markets to help me guide you through a path to profits. And there is one item that caught my eye that I’m sure isn’t being reported by media outlets, such as CNBC. 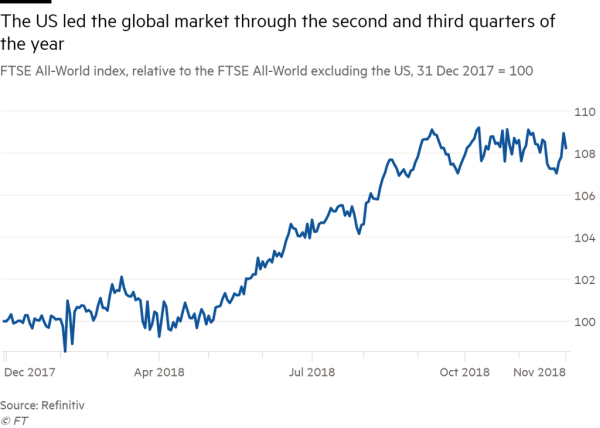 That is, after powering ahead of global rivals for much of the summer, the U.S. stock market has been struggling to continue outperforming since the peak in late September. The chart below illustrates that point. Other markets, which have been beaten down, are starting to outperform. For example, in November, the Hang Seng index in Hong Kong soared by 6.1%. Such a rebound is not surprising when you consider the battering it took because of the U.S.-China trade war. The recent relative outperformance of some foreign markets had me thinking again about those foreign stocks you can buy in the U.S. in the form of an ADR (American Depository Receipt) and how you can buy some of these through the Robinhood brokerage firm for zero commission! Robinhood is still growing rapidly. It added about 3 million accounts over the past year, bringing its total number of customers to 5 million, which is more than twice the big three incumbent discount brokerage firms combined. And it remains the only venue that offers trading on stocks, options and cryptocurrencies all in one place. I first told you about it adding ADRs back in September. At that time, Robinhood announced it was adding about 250 ADRs from Japan, China, Germany, the U.K. and elsewhere. ADRs of companies from France will be added in the coming months. A quick definition of ADRs is that they are stocks of foreign companies that trade and settle in the U.S. market in dollars, allowing investors to avoid having to transact in a foreign currency. The company found its users wanted access to global stocks by looking at its own search data. Robinhood’s staff has access to what people are typing into the app’s search and looking to trade. Names such as Nintendo, Adidas, BMW and Heineken continued to pop up. The company used similar reasoning in February when it decided to add cryptocurrency trading after users repeatedly searched for bitcoin. 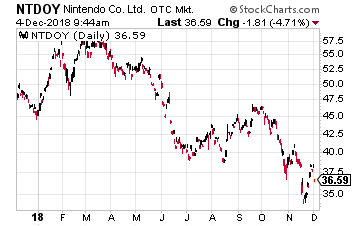 If you have children, you no doubt have heard of the Japanese gaming company Nintendo (OTC: NTDOY). It is doing well and recently announced its best quarterly results in eight years! It reported operating profits of ¥30.9 billion ($27.2 million) for the July to September quarter, up 30% on the same period a year earlier. Its recent success has been due in large part to the popularity of its Switch console. Nintendo said that over the April to September half it had sold 5.07 million units of the Switch console, adding that it would maintain its full-year sales target of 20 million units by the end of the financial year ending March 31, 2019. And despite a visibly slower pipeline of blockbuster titles this year, sales of Switch games reached 42 million in the April to September period, almost double what was sold in the first half of the company’s previous fiscal year. And its next blockbuster – Super Smash Bros Ultimate – is only being released on December 7. Despite this, the highest ranked title in Amazon’s list of the best-selling games of 2018 is Super Smash Bros. That suggests there have been a lot of pre-orders and that means it could be a record-breaking hit. With the games industry tilting towards the huge Asian market – UBS expects gaming revenues in Asia to grow 9.5% annually to $200 billion in 2030 – Nintendo seems well-positioned. One company that many U.S. investors have never heard of is South Africa’s Naspers (OTC: NSPNY). Yet, it is perhaps the savviest venture capital investor in the world. It is best known for taking a major stake in China’s tech giant Tencent (OTC: TCEHY) back in 2001 for a mere $31 million. That stake grew in value to $175 billion earlier this year! If there is one thing I love as an investor, it is buying something on the cheap. And Naspers is that. The entire current valuation of Naspers is valued at about $25 billion less than just its stake in Tencent! And all its other investments in technology companies around the emerging world are valued at nothing – you’re getting them all for free! It comes down to the same old Wall Street bugaboo – its analysts are either too lazy or not smart enough to understand Naspers business. Its business is very successful, posting a 39% rise in half-year earnings. The earnings of $1.7 billion in the six months ended in September were driven by Naspers’ classifieds business becoming profitable as well as Tencent generating stronger profits. The company touts a 22% internal rate of return on non-Tencent investments since 2008, including a stake in Flipkart of India which was sold to Walmart earlier this year. Africa’s largest company has begun to tackle the steep discount in its share price to its net asset value. As part of tackling the discount, this year Naspers announced plans to spin off its African pay-TV arm and it did raise $10 billion from selling off some of its Tencent shares, reducing its stake to 31%. I look forward to its spinoff of its very successful pay-TV arm Multichoice, which is Africa’s Netflix and more. Its services include sports broadcasting and South Africa’s Dstv, reaches 13.5 million households on the continent and generated profits of 6.1 billion rand ($409 million) during its latest fiscal year. 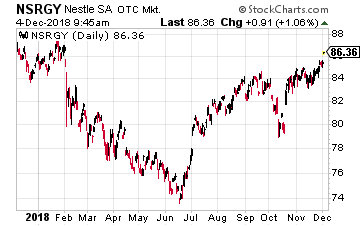 For more conservative investors, there is the world’s largest food and beverage company, Switzerland’s Nestlé (OOTC: NSRGY), which was founded as a baby food manufacturer in the 1860s. Today, Nestlé’s four priority markets are coffee, bottled water, pet food and baby food. I suspect that someday the company will be making some large divestitures. One of these will likely be its frozen foods business, which controls a 29.6% share of the U.S. market. Another may be its consumer nutrition and consumer healthcare division. Already, Nestlé has said it plans to spin off or sell its skin health business. In the latest streamlining measure by CEO Mark Schneider, Nestlé said it had decided the future of Nestlé Skin Health, which analysts said could be worth as much as 7 billion Swiss francs ($7 billion), laid “increasingly outside the group’s strategic scope”. The division had sales of 2.7 billion Swiss francs last year and makes prescription items, anti-wrinkle creams and other consumer healthcare products. Nestle said it would “explore strategic options” for the business, which could include a sale, spin-off or even a stock market listing. Possible buyers could include consumer or pharmaceutical groups. Nestlé said that the planned sale or spin-off would “sharpen its focus” on food, drinks and “nutritional health products”, led by its top brands including KitKat chocolate bars, Perrier bottled water and Purina pet food. 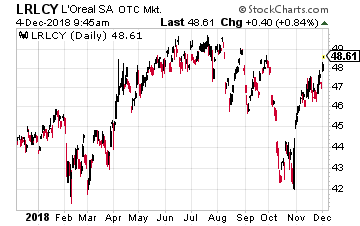 The decision to abandon the skin health business I believe reduces still further the strategic case for Nestlé selling its 23% stake in the French cosmetics giant, L’Oreal (OTC: LRLCY). There you go – three high-quality foreign stocks you can buy for zero commission at Robinhood.